Few of us can say they knew someone who fought in WWI. 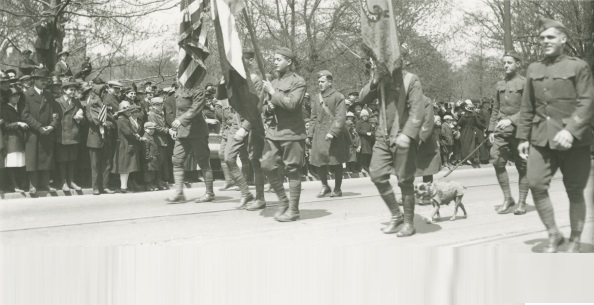 Tuesday, May 8, 1945, VE Day, when war ended in Europe for the second time in a quarter century, my mother rushed me out of the apartment to join a mass of people, who cheered as soldiers from WWI paraded down Main Street. My grand-uncle George, who fought in WWI and suffered the long effects of being gassed, had recently died. A couple years later our neighbor Mr. White, a WWI vet, France in 1917, gave me his gas mask, jacket and helmet. I still have his jacket; it’s over 100 years old. You ask when’d my son gone off to war—, well, after we stopped schoolin’ kids, there’d been a last one; after the limbless and deaf that’d served . . ., dropped dead; after mums and dads who’d lost boys, grow’d old and passed—after all ’minders of the last un’ was forgot; after the pockmarked, lumpy fields that staked Jesus crosses in a weed-ridden patch lost traces, of a no-man’s-land betwixt windin’ trenches below fields of spiny trunks, craters the size of babies, the stink of phosgene and chlorine—; where dogs no more go and birds no more sing—. that cycled back like a hungry dog. elle est morte d’être gazés.